Search real estate listings & houses for sale in North Dallas and Far North Dallas. To change how the search is displayed, click the gray button next to "Sort Listings By." Using the gray button below, you can sort homes by prices or days on market. For information about North Dallas real estate, or to schedule a showing, click "Request a Showing" when viewing any listing in North Dallas. You can also create and save a custom home search by clicking the "Save this Search" button and register for a free account. A custom search will allow you to receive email alerts when new North Dallas homes hit the market. KnoxRE.com is updated every 15 minutes by a direct feed (updated every 15 minutes) from the local MLS which will give a visitor desired information for homes in North Dallas like property images; days on market; subdivision information; feeder school information; HOA dues; frequency of the HOA dues; estimated county taxes and more. If you see a property displayed, it means the house is still available for purchase. Our site only displays currently active homes for sale in North Dallas. If a listing goes under contract, it is removed from the listing display for ease of use and navigation for visitors. To view more properties for sale near North Dallas, see the alphabetical list of the home listings in the area below. Click on any of the related links below to visit that page. If you would like to view all real estate listings, click on the main navigation bar links at the top of the page. North Dallas real estate is some the most expensive in the entire city. Rivaling Highland Park and University Park, North Dallas real estate has listed an estate as expensive as $100,000,000. The homes in the North Dallas area price from approximately as low as $50,000 for a small condo with one bedroom to over $15,000,000 for the more luxury properties. The area caters to those with expensive tastes who want custom homes set on larger lots. Some of the more expensive homes in North Dallas will give buyers lot sizes of over an acre with houses exceeding 10,000+ square feet. Inside these North Dallas luxury homes, buyers will find all of the custom upgrades one would expect at this price point. The upgrades inside will include but are not limited to - scraped hardwood flooring, natural stone flooring with travertine, marble and slate, interior elevators, wine storage areas, wine rooms, theater rooms, libraries, multiple fireplaces, and multiple staircases, game rooms, outdoor living areas, custom swimming pools and more. The homes in North Dallas are zoned to the Dallas Independent School District. However, many owners of the homes in the area choose to send their children to the local, private schools in the area. The area is home to some of the best private schools in the state with St. Marks, ESD, Greenhill, Hockaday, Lamplighter and others. Real estate in North Dallas is located in several zip codes in Dallas including but not limited to 75220, 75225, 75229, 75230, 75240, 75244, 75252, 75254 and 75287. The area of homes in North Dallas is defined as including the Park Cities (Highland Park & University Park) and north, south of President George Bush Turnpike, east of Midway Road and west of North Central Expressway (Interstate 75). Popular North Dallas neighborhoods include, but are not limited to the following list. To search homes in any of the North Dallas areas displayed below, simply click on the name of the neighborhood. 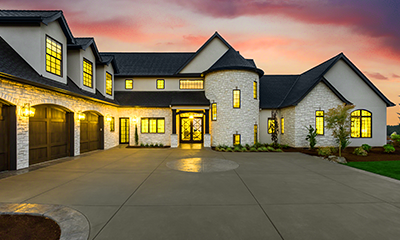 The luxury homes in North Dallas are usually found in Bent Tree, Glen Abbey, Midway Hollow, and Preston Hollow. More moderately priced houses will be located in the Northwood Hills, Prestonwood, and University Place neighborhoods. Considering looking homes, or selling a house in the North Dallas area? Knox & Associates real estate agents are North Dallas neighborhood experts, and we’d love to help! Our direct phone number is 972-342-0000. Or you may contact us via the contact form here. If you are looking at real estate for sale, contact us to schedule showings of the properties that catch your attention. For sellers, our North Dallas REALTORS® will schedule a convenient time to meet for a consultation; create a custom, full-market analysis of your house; and formulate a fair-market opinion as to the best asking price for your home. We can provide up-to-the-minute North Dallas real estate statistics: current average asking prices on the homes for sale; the sales' history of currently sold houses in the North Dallas neighborhood; and information about broader market trends so that you can make a well-informed decision. Knox & Associates' REALTORS® in North Dallas are full-time, trusted, professional real estate agents. This means you will be teaming with a dedicated expert whose goal is to negotiate the quickest home sale possible with the highest net return to the client.